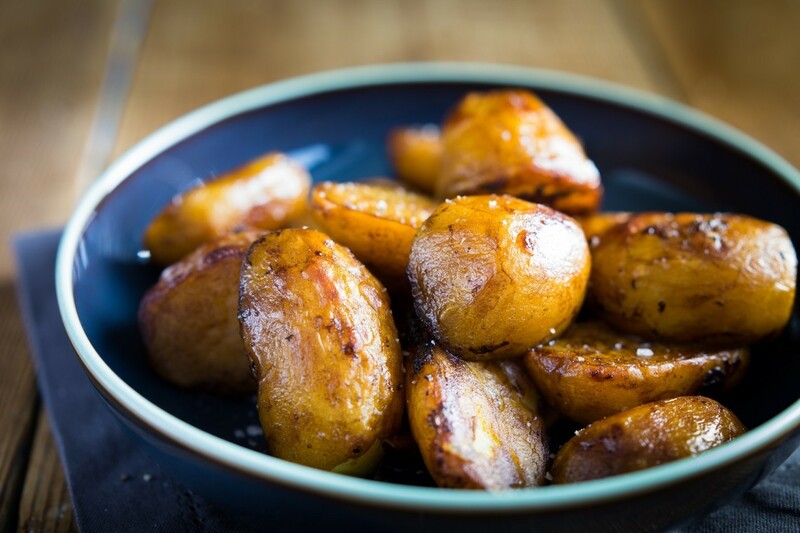 Here’s a deliciously full-flavoured version of roasties that would be a perfect complement to a juicy joint of beef or rich game stew. 1Peel the potatoes and chop in to quarters or halves, depending on the size. 2Par boil in the Guinness for 15 minutes until the potatoes are tender.Most of the Guinness should evaporate off and infuse the potatoes with its rich flavour. 3Preheat oven to 200°C / Fan 180°C / Gas 6 while the potatoes are on the hob. Place the roasting tin in the oven to get nice and hot. When they are almost parboiled add the oil to the roasting tin to heat up. 4Drain thoroughly in a colander and place carefully into the hot oil in the hot roasting tin. Stir gently so they are all coated with oil. 5Roast for 30-40 minutes, turning occasionally so they get cooked evenly. 6Sprinkle with a little sea salt before serving if desired.